An excellent machine for serious workouts, the stationary rower combined with a healthful diet can drive the pounds off fast. But healthful, quick weight loss might not be what you're used to hearing about on infomercial advertisements. The Centers for Disease Control and Prevention observes that losing weight at a rate of 1 to 2 pounds a week makes you more likely to keep the weight off in the long run. Promises of super-fast weight loss are tempting but often involve unsustainable life changes like extremely restricted diets or dehydration. Once you inevitably give those changes up, the weight comes right back on. Although losing 1 to 2 pounds a week might not seem "fast," it adds up to a respectable 50 to 100 pounds per year. 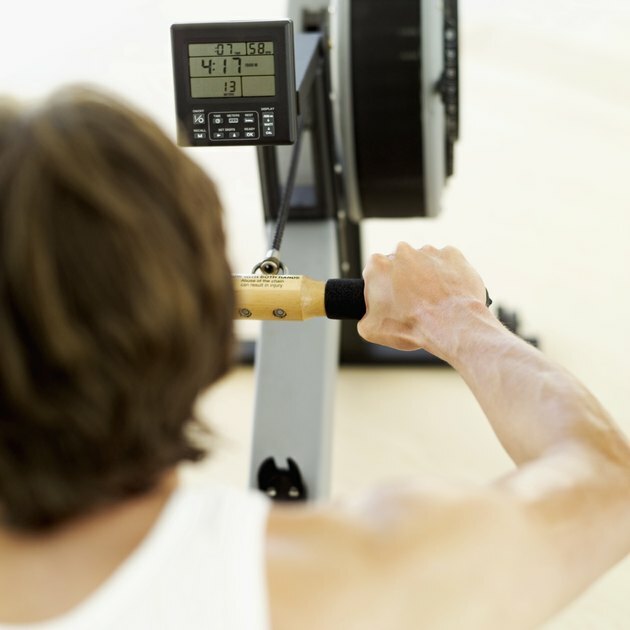 If you take the weight off with sustainable life changes -- in which using a rower regularly can play a big part -- you often lose weight faster over the long run because you don't have to lose the same pounds more than once. To enjoy the full benefit of using a rower, you must employ proper technique. Don't sit down and scoot back and forth, tugging on the handle. Instead, start with a strong leg drive, pushing your seat back. Lean back slightly from the hips at the end of the leg drive -- think of swinging from 1 o'clock to 11 o'clock on a clock face -- and bring the handle quickly in to your lower ribs. Then reverse the motion, extending your arms, hinging forward from the hips and bending your knees in preparation for the next stroke. The American College of Sports Medicine notes that if you want to lose weight, you might need to exercise as much as 60 to 90 minutes per day. The more you exercise, the more calories you burn and the faster you lose weight, as long as you don't overtrain. Give yourself at least one rest day a week and watch out for symptoms of overtraining like unusual fatigue, increased muscle and joint soreness, insomnia and increased resting heart rate. You can keep exercising through mild soreness, but if your muscles are extremely sore from rowing, perform other, gentler cardio or rest until the soreness subsides. If you weigh 125 pounds, you can burn 510 calories per hour of vigorous stationary rowing, according to Harvard Health Publications. The heavier you are the more calories you burn. If you weigh 185 pounds, you can burn 754 calories per hour. Even if you're relatively light, you can still work out harder to increase your calorie burn. Try spiking your long workouts with intervals of high intensity, either by increasing your stroke rate or using higher resistance for a short period. Aim to burn between 500 and 1,000 calories per day to hit a weight-loss goal of 1 to 2 pounds per week. If you tolerate this activity level well, you can increase your calorie-burn goal to lose weight even faster. For every 3,500 calories you burn off and don't replace with food, you lose about 1 pounds of body fat. But that doesn't mean you should starve yourself. If you don't consume enough nutrients to fuel your body's increased activity levels, your body might actually reduce its metabolism, making weight loss more difficult. Speed your weight loss along by consuming a reduced-calorie diet rich in nutrients. As a general rule you can consume as many fruits and vegetables as you want, along with reasonable helpings of whole grains and lean protein. This fuels your body without replacing all calories you're working so hard to burn off.